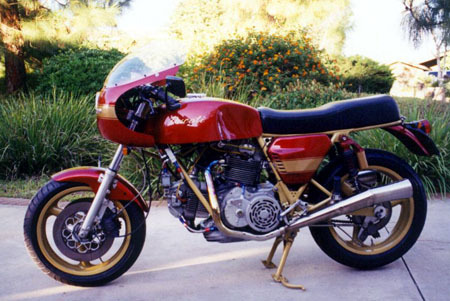 Forks are from a 1988 Yamaha FZR 750 roadracer, with RaceTech emulator internals and lighter springs. Shocks are Ohlins, originally setup by Bruce Burness, the designer of the shocks. The frame is a 1973 750 Sport frame powder coated by Olympic in Santa Ana. It has remanufactured centerstand support plates welded on by Rob North. Rob also made the headers. They are tucked in compared to stock. Rob also made new rear footpeg/muffler mounting tubes, in slightly different shape so that they would clear the custom swingarm. Wheels are magnesium Marvics. The front is a 17 inch and the rear is an 18 inch from a Honda 500 road racer circa 1983 or so. Brakes are AP. Tank, covers and rear fender are from Syd's Cycles. The front fender is from a Honda Nighthawk or Shadow. The bars are from Pro Italia. 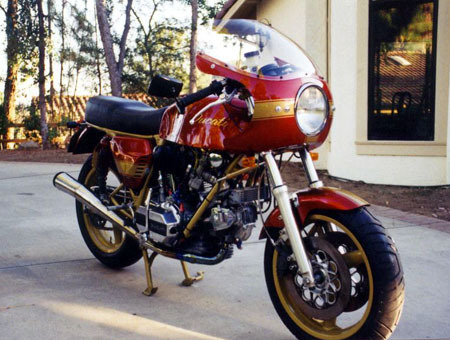 The paint design and application is by Len Lochmiller, a true artist, local in San Diego. He also widened the rear fender and made a seat pan and tool tray out of fiberglass. I wired the bike myself. Swingarm is custom made box section later strengthened by Bruce Burness. The swing arm is stock length. Engine: 905 cc with 88 mm JE pistons (my own dome), S-2 cylinders, 12:1 CR, (actual measurement). Heads are belt drive 1984 with re-angled valves welded and re-contoured ports with bevel drive housing grafted on. The crank has plain bearing Carillo rods from Axtell's flattrack engine projects, with my own pin design. The oil pump is speeded up with gears from Albert Bajohr of Germany, one of the earliest guys to try a plain bearing conversion. Flow to the heads is restricted with carburetor jets at an external manifold. The drain lines from the heads to the sump prevent oil from landing on the crank counterweights. This allows the engine to rev more quickly, reducing the water wheel effect. Pressure feed is out of the engine from the factory cast-in boss, located in-between the front cylinder and tower drive tube, up to an externally mounted oil filter, down to a cooler and then to a distribution manifold with appropriate orifices. I try to hold oil pressure at 70 psi at full speed. Transmission is Brook Henry’s 3-dog gearbox. The clutch is Vee-Two. It comes with the vented cover. 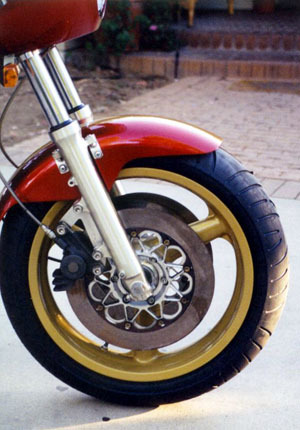 The clutch uses Barnett Kevlar clutch plates and 916/996 heavy-duty springs. The clutch actuator arm is lengthened 1 inch to improve leverage for heavier springs. Headers are 1-3/4 inch with Axtell 27-in. megaphones and a Supertrapp muffler to try to cut the noise somewhat. The bike is loud. Carburetors are 40 mm Dellortos, with lengthened manifolds and big K&N filters. Ignition is Lucas-Rita. Timing is at 36 degrees. 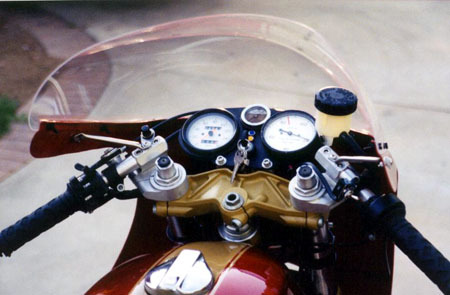 Instrument panel is my own design which I had to change from my first one in order to mount the Syd’s quarter fairing. The front brake master had to be changed to a remote style Nissin to allow clearance for the fairing.